Get some chicken out and make one of these homemade Italian chicken recipes. Including chicken carbonara, chicken piccata, chicken parmesan and many more below - all recipes from Italy. Simple to make and delicious. This Italian chicken recipe is comfort food at it's best. In a large heavy skillet, fry bacon until cooked (not crispy); drain and set aside. Fry the chicken strips and onion in the bacon fat until meat is cooked through. Drain well. Discard the bacon fat. Serve with a salad and crusty butter bread. 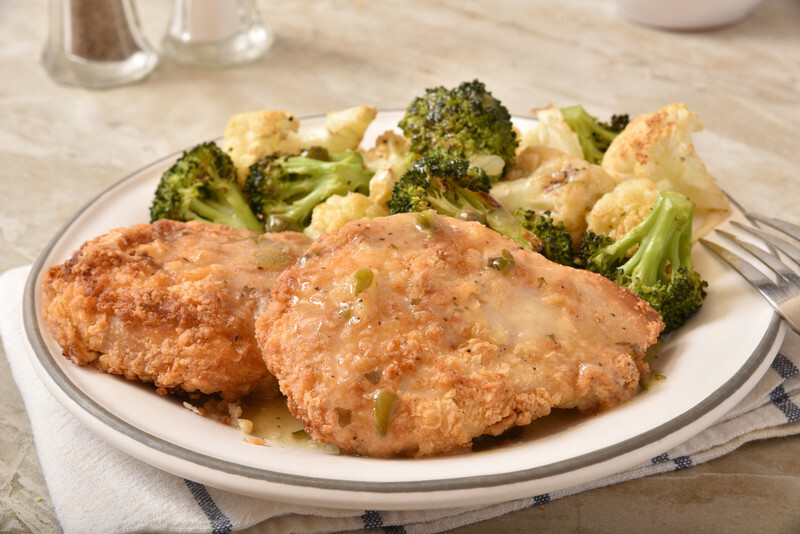 This Italian chicken recipe has the best of both worlds; chicken and lemon. Serve over buttered angel hair pasta. Pound the chicken breasts until flattened. Add the butter and oil in a heavy skillet on medium high. While it's heating up, combine the flour with the garlic powder, onion powder, lemon zest, paprika and place in a resealable bag. Wet the chicken pieces in half of the lemon juice and place in the bag; shaking to coat evenly. Season to taste with salt and freshly ground black pepper. Fry in the skillet until golden brown and completely cooked; juices will be clear. Place the chicken in the oven on a baking sheet to keep warm while you make the sauce. Bring the chicken broth and lemon juice to a boil in a saucepan. Whisk the cornstarch with the 1/4 cup of water and slowly add to the broth; whisking continuously until thickened. To serve: place some of the buttered pasta on your plate and top with a chicken breast. Pour the lemon sauce over all. 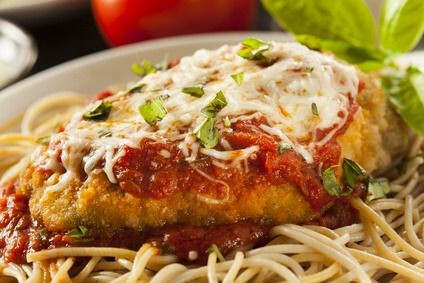 My Italian chicken recipes have one of my favorites; Chicken Parm. PREHEAT oven to 350 degrees. Lightly spray a 9x13 dish with vegetable oil. Mix the crumbs, parmesan cheese, basil, pepper and salt together on a plate. Place the olive oil, melted butter and minced garlic in a resealable bag. Add the chicken to the olive oil mixture and toss to coat evenly. Then roll into the crumb mixture. Pour the spaghetti sauce in the bottom of the pan and place the coated chicken breasts on top. Bake for 30 minutes and add the cheese on top of the breasts and bake until cooked or when juices run clear. (another 5 to 10 minutes longer). Serve over cooked and buttered spaghetti noodles; serve with garlic bread. NOTE: If you have leftover bread crumbs, drizzle the breasts with the remaining garlic/oil mixture and sprinkle remaining crumbs over the breasts before baking them.